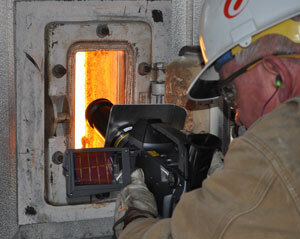 The FLIR GF309 is designed for high temperature industrial furnace applications. These infrared cameras are ideal for monitoring all types of furnaces, heaters and boilers, particularly in the chemical, petrochemical and utility industries. Custom-built to see through flames, the FLIR GF309 also features a detachable heat shield designed to reflect heat away from the camera and camera operator, providing increased protection. 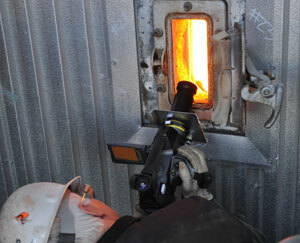 FLIR has developed a camera specially designed to inspect industrial furnaces, heaters and boilers, the FLIR GF309. The camera is equipped with a special mid wave “flame filter” that is specifically engineered for high temperature (up to 1500°).